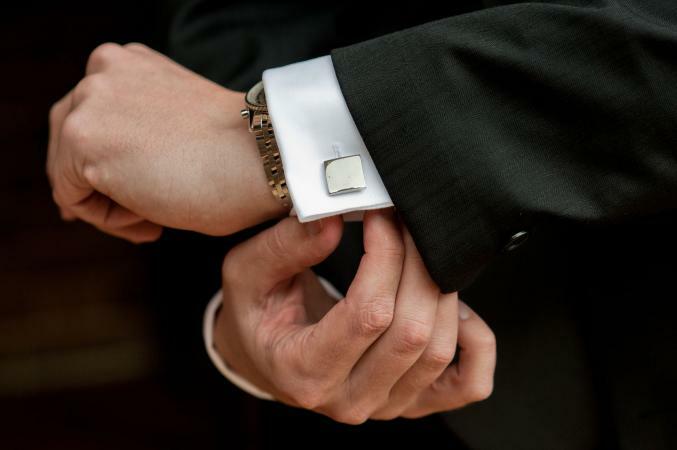 A cuff link is a piece of jewelry that inserts into a buttonhole to fasten a shirt cuff around the wrist. Most commonly, cuff links come in pairs and consist of an ornamental head connected to a backing plate by a maneuverable link. Studs consist of an ornamental head fixed to a protruding pin or knob; front and back connect using a detachable clasp. Akin to buttons, studs can fix permanently to a collar or shirtfront, or can be detached when desired. There are various methods of fastening available. Harold Newman describes five basic forms: the chain link, fastened to each head by a jump ring; the lentoid form, a backing head joined by a fixer bar to the ornamental head; the dumbbell, with one or both heads screwed into a vertical bar; the extension cuff, which conceals a retractable coil, thus allowing the shirtsleeves to rise to the elbow; and the snap lock, a simple press stud. Peter Hinks, as well as Eve Eckstein and Gerald Firkins, provide illustrations of such mechanisms and information regarding original patents. In the early nineteenth century, cuff links and studs became widely accepted accessories for any gentleman of taste. This emerging fashion paralleled the rise of the lounge suit (which appeared in the 1880s) and the white tailored shirt, which sported a turned-down collar and unfastened cuffs. Previously, men's shirts had stiff upright collars that required minimal fastening; extravagant bows or buttons fastened the cuffs. However, such ornate fashions did give way to uniform formality, this more somber attire required practical and discreet adornment. As such, men's jewelry became restricted to an ensemble of complementary pieces, made up of cuff links, studs, a tie or cravat pin, and buttons. These often came as a set-presented in a box or on a card-they tended to complement a gentleman's signet ring, fob watch, and chain. In essence, chromatic unity was the order of the day. Initially, cuff links and studs were made of 15 to 18 karat gold; this indicated wealth and did not discolor the shirt. Round, square, or oval in shape, both pieces were often decorated with fine engraving, enamel work, or ivory. Sometimes small gems, pearls, or onyx were placed in the center of the head to add value. However, in the mid-to-latter part of the century, mass production revolutionized manufacture. Due to their simple design, cuff links and studs were perfect for bulk replication. As hand finishing was widely abandoned, 9 karat gold became the metal of choice. Consequently, compromised standards became the norm. By the late 1800s, Birmingham was the center of all industrial enterprise. However, the production of cuff links and studs also occurred in the colonies, France, and the United States. Firms such as George West, Greaves' Patent, W. E. Riley and Sons, the French F. Moore, and the U.S.-based Baer and Wilde improved fastening technology and competed for a share of the lucrative accessory market. Accordingly, advertisements promoted function and style, longevity, and decorative appeal. In the late nineteenth century, the Arts and Crafts movement advocated a return to handmade pieces, sparking a revival in the collection of quality items. However, mass production has prevailed and cuff links and studs remain popular unisex gifts. Their ability to convey affiliations and interests endures through the novelty of the ornamental head. See also Canes and Walking Sticks; Men's Formal Wear; Jewelry; Neckties and Neckwear; Watches. Eckstein, Eve, and Gerald Firkins. Gentlemen's Dress Accessories. Buckinghamshire, U.K.: Shire Productions Limited, 2000. The original edition was published in 1987. Hinks, Peter. Victorian Jewelry: An Illustrated Collection of Exquisite 19th Century Jewelry. London: Portland House, 1991. Marshall, Suzanne. 200 Years of American Manufactured Jewelry and Accessories. Atglen, Pa.: Schiffer Publishing, 2003. Newman, Harold. An Illustrated Dictionary of Jewelry. London: Thames and Hudson, 1981.